I had been familiar with Intastop and its products and when we commenced work on this project I knew that the Inpro range of products was more suited to the requirements of the building and the demands it would have on its interior specification. Our client was thrilled with the delivery of the project and the products which gave a superb finish. They have great confidence that they will be hard wearing and protect key areas of the hospital where high levels of patients, visitor traffic are experienced. Brian Quigley SBI Style Blinds & Interiors Ltd.
Our Lady of Lourdes Hospital required a refurbishment in areas of high footfall. The hospital benefited from a market leading wall protection after installers chose to upgrade from the architect’s original specification. Wall and door protection specialist Intastop, was re-specified in the project due to its unswerving credentials and compatibility with other aspects of the refurbishment scheme at Our Lady of Lourdes Hospital in Drougheda, Co Louth, Ireland. The product range specified included products from our partner Inpro, and IPC Hand & Combi-Rails, Soft PVC Corner Guard and Heavy Duty Rubber Wall/Corner Protection were used throughout the project. 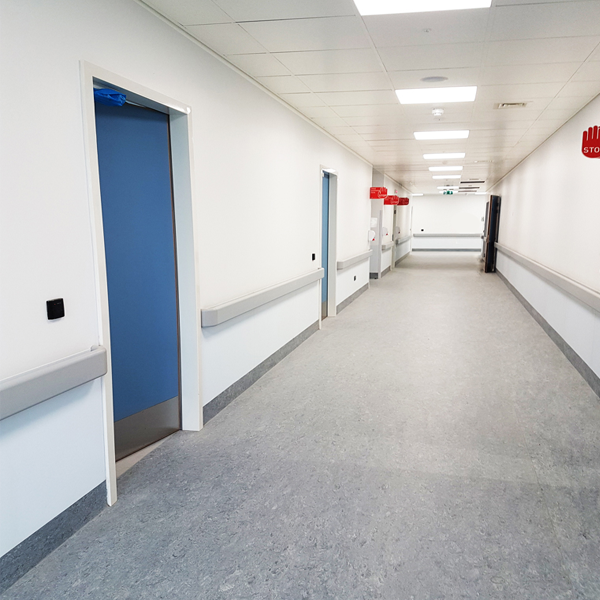 Inpro, a product from renowned wall and door protection specialist Intastop, was re-specified in the project due to its unswerving credentials and compatibility with other aspects of the refurbishment scheme at Our Lady of Lourdes Hospital in Drougheda, Co Louth, Ireland.